The International Fashion Week 2010, aka IFW10, produced by GLANCE International Agency (GIA) will launch later today. I had a chance to take a little sneak peak to some of the fashion items available at the event. The 20 featured fashion designers at the event include Hyper Culture, Convoitise, Mea Culpa, Indyra Originals, Ranena Olivier Couture (ROC), A La Folie, Aleida, Angel Dessous, Orage Creations, KIM Fashion, Nefertiti Kimagawa, Son!a, MIAMAI, Faster Pussycat, SHIKI Design, JADOR Fashion, Naive, SwanSong, G. Sloane Couture and PurpleMoon Creations. On this first post about the event I'm taking a good look at some of the beautiful items from PurpleMoon. It is unusual to see me in more formal fashion looks. 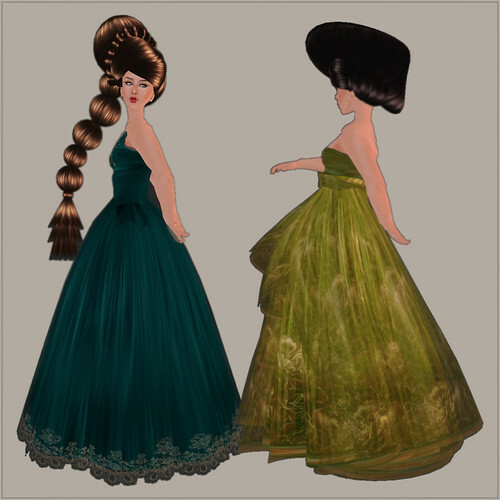 Honestly speaking I have been pretty much ignoring the formal style in SL and it took me by surprise to see how beautiful and detailed these gowns actually are. Sunshine, seen here in Green & Brown, is probably closer to my usual style. In it's simple style I could see myself wearing the dress in both formal and informal events, even in everyday use. The dress includes the basic dress and a sheer dress to be worn over the basic one (see the first picture). This makes it flexible and modifiable for different sorts of looks. The hairdo is an interesting and unique runway hair called Kay, which you can see here in Ebony. Lois, presented in Teal has more imposing look. The outfit includes a hat, which is not shown in these pictures and there's a "tail" part for the dress that can be left out to make the gown slightly more humble in it's style. The runway hair Lea, worn here in Chocolate is going to be filed as one of my favorite hairdos so far. It is rather crazy and extravaganza which makes it pretty much perfect. 3 comments for "IFW10 Sneak Peak #1"
These look uncannily like Dawn dolls! Thanks for the memory-jog. Too cute!